Contact lenses are now more popular than ever. The Association of Contact Lens Manufacturers estimates there are now more than 3.3 million people in the UK wearing contact lenses. There are different types of lenses available for different eye problems, but they generally fall into two categories of hard and soft lenses. Almost anyone can wear contact lenses although special care is needed for children and older people. Contact lenses can treat short sightedness and long sightedness. There are also lenses available for astigmatism and presbyopia. Contact lenses are held in place by the tears in the eye between the lens and the front of the eye. 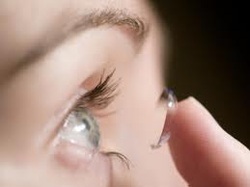 Most contact lenses are worn on a daily basis and they should not be worn overnight. In some cases your optician may advise you that it is safe to wear your lenses when sleeping but check if you are not sure. After an eye examination, which includes checking your eyes are suitable for contact lenses as well as eye problems and the early signs of eye disease, your optician will fit the lenses. They will check that your tears are a good quality to ensure that the lenses are kept lubricated. They will also measure the size of your cornea, the pupil and the position of your eyelids to ensure the correct size lenses are fitted. Soft lenses are made from oxygen permeable plastics which become pliable during manufacturing. They contain between 30 and 40 per cent water and are very comfortable to wear, as well as being easy to fit. Astigmatism, where the shape of the cornea causes distorted eyesight, can be treated with ‘toric’ contact lenses. Bifocal contact lenses are used to treat presbyopia, when a person has difficulty seeing close up particularly when reading. This condition was traditionally treated by wearing reading glasses for close up tasks but now bifocals ensure the person can see objects in the distance and as well as for reading. by rigid gas permeable lenses. lenses. Once a person has got used to the lenses they are generally just as comfortable to wear as soft lenses. Disposable lenses are very popular especially with those who have a busy lifestyle. There is no need to look after the lenses as they are replaced each day with new lenses and the old lenses are thrown away. It is also means you do not have to worry about losing a lens. The cost of disposable lenses is very comparable to other lenses. They are often not any more expensive than non-disposable lenses. Your optician will advise you how often you need to replace the lenses. This can vary from daily replacement to a much longer period. see through the centre of your vision - the best part of your vision, as they move when your eye moves. Almost anyone can wear contact lenses, although special care is needed for older people and children. Your optician will be able to show you how to correctly insert the lenses. Common eye problems such as short-sightedness and long-sightedness can be corrected with contact lenses. If you have astigmatism or presbyopia there are also contact lenses available which can correct or manage these conditions. There are also tinted contact lenses which can enhance or change the colour of your eye. Please feel free to come and discuss the best option for you. Monthly payment plans are available.